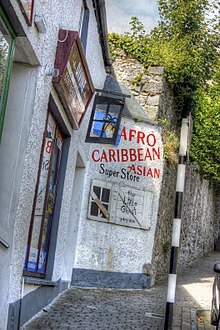 During the post-Columbian era, the archipelagos and islands of the Caribbean were the first sites of African diaspora dispersal in the western Atlantic. Specifically, in 1492, Pedro Alonso Niño, an African-Spanish seafarer, was recorded as piloting one of Columbus' ships. He returned in 1499, but did not settle. In the early 16th century, more Africans began to enter the population of the Spanish Caribbean colonies, sometimes arriving as free men of mixed ancestry or as indentured servants, but increasingly as enslaved workers and servants. This increasing demand for African labour in the Caribbean was in part the result of massive depopulation of the native Taino and other indigenous peoples caused by the new infectious diseases, harsh conditions, and warfare brought by European colonists. By the mid-16th century, the slave trade from West Africa to the Caribbean was so profitable that Francis Drake and John Hawkins were prepared to engage in piracy as well as break Spanish colonial laws, in order to forcibly transport approximately 1500 enslaved people from Sierra Leone to San Domingo (modern-day Haiti and Dominican Republic). During the 17th and 18th centuries, European colonial development in the Caribbean became increasingly reliant on plantation slavery to cultivate and process the lucrative commodity crop of sugarcane. On many islands shortly before the end of the 18th century, the enslaved Afro-Caribbeans greatly outnumbered their European masters. In addition, there developed a class of free people of color, especially in the French islands, where persons of mixed race were given certain rights. On Saint-Domingue, free people of color and slaves rebelled against harsh conditions, and constant inter-imperial warfare. Inspired by French revolutionary sentiments that at one point freed the slaves, Toussaint L'Ouverture and Jean Jacques Dessalines led the Haitian Revolution that gained the independence of Haiti in 1804, the first Afro-Caribbean republic in the Western Hemisphere. Usain Bolt — Jamaica, Olympics Gold Medalist and World's Fastest Man. ^ "Trinidad and Tobago 2011 population and housing census demographic report" (PDF). Central Statistical Office. 30 November 2012. p. 94. Archived from the original (PDF) on 19 October 2017. Retrieved 5 March 2016. ^ Committee on Foreign Affairs, United States Congress House (1970). "Hearings". 2: 64–69.